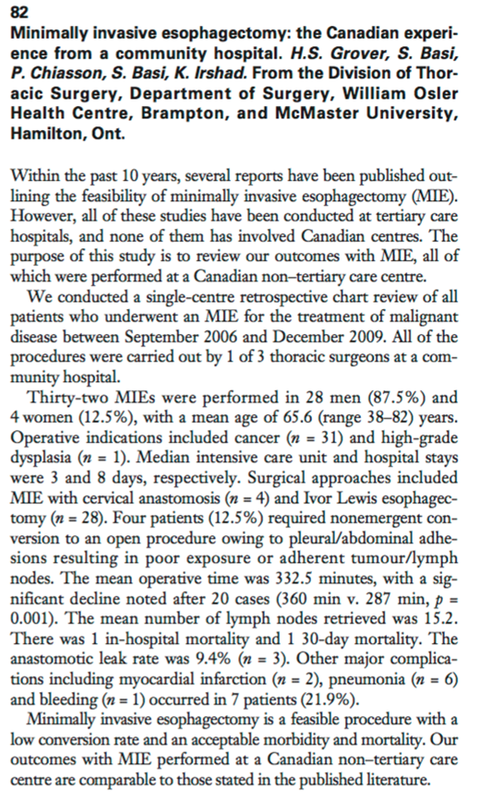 82 Minimally invasive esophagectomy: the Canadian experi-ence from a community hospital. H.S. Grover, S. Basi, P. GOlesson, S. Best, K. Haled. From the Division of Thor-acic Surgery, Department of Surgery, William Osier Health Centre, Brampton, and McMaster University, Hamilton, Ont. Within the past 10 years, several reports have been published out-lining the feasibility of minimally invasive esophagectomy (MIE). However, all of these studies have been conducted at tertiary care hospitals, and none of them has involved Canadian centres. The purpose of this study is to review our outcomes with MIE, all of which were performed at a Canadian non-teniarymre centre. We conducted a single-centre nrompecive chart review of all patients who underwent an MIE for the treatment of malignant disease between September 2006 and December 2009. All of the procedures were naiad out by 1 of 3 thoracic surgeons at a com-munity hospital. Thirty-two MlEs were performed in 28 men (873%) and 4 women (12.5%), with a mean age of 65.6 (range 38-82) years. Operative indications included cancer (n = 31) and high-grade dysplasia (n I). Median intensive mre unit and hospital stays were 3 and 8 days, respectively. Surgical approaches included MEE with conical anastomosis (n = 4) and Ivor Lewis esophagec-tomy (e = 28). Four patients (12.5%) required nonemergent con-version to an open procedure owing to pleural/abdominal adhe-sions resulting in poor exposure or adherent rumour/lymph nod.. The mean operative time was 332.5 minutes, with a sig-nificant decline need after 20 cases (360 min v. 287 min, p = 0.001). The mean number of lymph nodes retrieved was 15.2. There was 1 in-hospital mortality and I 30-day mortality. The anastomotic leak rate was 9.4% (n = 3). Other major complica-tions including myocardial infarction (n = 2), pneumonia (n = 6) and bleeding (n = 1) occurred in 7 patients (21.9%). Minimally invasive esophagettorny is a feasible procedure with a low conversion raw and an acceptable morbidity and mortality. Ow <mown. with MIE performed at a Canadian non-tertiary care centre are comparable to those staved in the published literature.